Time to Play: 30 Min. 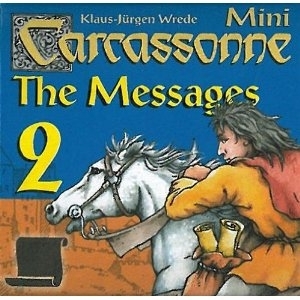 In Carcassonne: The Messages, a small expansion for Carcassonne, players place a second meeple (included in this expansion) on the score board at the start of the game. Whenever they score points during the game, they decide which scoring meeple to advance; if a meeple lands on one of the dark spaces on the score track (0, 5, 10, etc.) and the owner of that meeple is the active player, then that player draws the top message tile from the track and either scores two points for it or takes the action shown on the tile. • Score that player's smallest road, city or cloister as if it were the end of the game, but leave the meeple in place. • Score two points for each banner in a city that player occupies or two points for each of that player's knights. • Score three points for each of that player's farmers. • Draw and play an additional tile. • Score one follower and return it to that player's supply. Whichever option the player chooses, he then places that tile on the bottom of the message stack. At the end of the game, players add the scores represented by their two scoring meeples, place one meeple on that sum, then figure out their final scoring, earning no more messages.